Aberystwyth University’s Department of Geography & Earth Sciences is one of the most established and experienced departments of its kind. Aberystwyth University offers you the unique opportunity to study geography in one of the most picturesque locations in Europe. Set on the coast of Cardigan Bay and surrounded by a great diversity of beautiful environments, including marine, moorland, mountain and grassland, the Department of Geography and Earth Sciences is uniquely placed to make the most of the stunning landscapes that surround it, providing you with a fabulous variety of fieldwork and recreational opportunities. 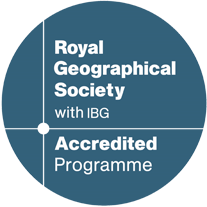 This degree accredited by the Royal Geographical Society (with IBG) will equip you with the skills, abilities and expertise to face and engage with the challenges facing society today. Why study Geography at Aberystwyth University? Fully stocked laboratories with an array of analytical instruments e.g. mass spectrometers and core scanners of which can be used for fieldwork and independent study. Employability is embedded within all courses provided by us. Our degrees provide a solid foundation for a vast array of careers across a range of sectors. In a rapidly shifting global economy, our graduates are adaptable and able to draw on a range of transferable skills, ensuring that they are always in demand. Our graduates have, for example, found employment as environmental consultants, planners, civil servants, surveyors, and in education to name a few. If you are interested in undertaking valuable work experience during your degree, then perhaps our sister course (F803) may be some interest to you. This course combines the identical syllabus as F800, however you will undertake your work placement in-between your second and final year. If you would like to study abroad during your degree, then our sister course (F802) may be for you. You will have the opportunity to study in any of our partner Universities across the world in-between your second and final year. DGES has also established Erasmus Exchange Programmes with the University of Bergen, the University of Oulu, Finland, and the University Centre in Svalbard, giving students the unique experience of studying in one of the world’s most extreme environments. We also have strong links with a number of universities in North America, where students can complete their second year of study. In recent years, our Exchange coordinator has overseen placements at Purdue University (Indiana), the University of Alabama, the University of Georgia, the University of Montana and the University of Ottawa in Canada. You can also choose optional modules to specialise or simply maintain a broad interest across Geography. Optional modules as diverse as glaciology, hydrology, volcanic hazards, past climate change, urbanisation, and rural change will enable you to tailor your study to suit your interests. Our courses are taught through lectures, seminars, laboratory and computer practical classes, small group tutorials, field courses and individual supervision of project work. We assess our students through a different range of methods. Some modules are assessed in part through traditional exams, but some have elements of coursework. We also have some modules that may require the student to produce practical reports, oral presentations, the design of web pages, production of short films, or contribution to online discussion forums. Some modules, notably the tutorials and field courses are assessed entirely through coursework.